In 1968, North Korea captured the USS Pueblo and took the ship’s 82 crew members captive for nearly a year. The so-called "Pueblo incident" cast a long shadow over relations with Pyongyang, which on Saturday unexpectedly released two other detained Americans. The American sailors suffered physical and mental abuse that, their former executive officer said, is never far from mind. Edward R. Murphy was second in command of the Pueblo while on a mission in the Sea of Japan to gather intelligence on Soviet and North Korean activity. Several ships had harassed the Pueblo for days, he said. But on January 23, 1968, North Korean torpedo boats opened fire on his poorly equipped vessel. "There was an exchange of fire, but it was one way, because we didn’t fire. We couldn’t man the weapon," Murphy said. The attack killed one sailor. Murphy and nine others were wounded. 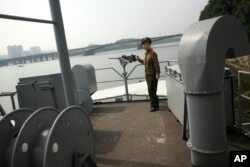 FILE - A North Korean guide poses near a machine gun on the spy ship USS Pueblo, now a tourist attraction in Pyongyang. The North Koreans took over the ship and some of its classified material. They immediately transported the crew to Pyongyang, where Murphy said the abuse began. "They’re beating you with rifle butts and karate kicking you, and they actually beat the side of my head," said Murphy. "… My ear lobe was separated." Murphy’s ordeal lasted for 11 months while the U.S. government worked to secure the crew’s release. Murphy was one of the last to cross to freedom over the so-called Bridge of No Return in the Korean Demilitarized Zone. In the years since then, his impression of North Korea has not improved. "That’s not a very friendly country toward Americans," he said. "Their people are trained to hate us." Forty years after his own detention, Murphy saw history repeating itself when North Korea imprisoned several American visitors to the country. "They haven’t changed much," he said of North Koreans. "The only value of the political prisoner is propaganda, and the more the U.S. press publicizes an event, the more the North Koreans love it, the more they are going to persist." "What the North Koreans want is direct talks with the United States," said former U.S. President Jimmy Carter, who has traveled to North Korea three times and helped secure the release of other Americans. The North Koreans said they were willing to receive him again, but he was frustrated by the conditions they set. "The proviso they put on it is that I would have to go as an official representative of the U.S. government," Carter said. "I informed the U.S. State Department about this, but the American government has decided that they do not want to send me over if I am an official representative of the U.S. government." Propaganda value has kept the USS Pueblo on display in North Korea. The captured American spy ship, which remains one of the oldest commissioned ships in the U.S. Navy, is a tourist attraction in Pyongyang. "I think it’s a tragedy," Murphy said. "That ship should have come home with the crew." Murphy’s mistreatment at the hands of the North Koreans is still evident in the way he walks today. He hopes his story, and the stories of other Americans detained in the communist country in recent years, will serve as a cautionary tale to those who seek to voluntarily travel to North Korea.